Rasmussen: "I was not in Italy"
"When Rasmussen was confronted with this information he confirmed to [team manager] Theo de Rooij he was at that moment in Italy," said Rabobank press officer Jacob Bergsma. "That was the reason De Rooij decided to get him out of the Tour and the team." CyclingNews reports that Rabobank has withdrawn Michael Rasmussen from the Tour, and that he will not take the start tomorrow. CyclingNews suggests it could relate to a report by Italian TV commentator Davide Cassani, who claims to have seen Rasmussen training in the Dolomites on June 13th or 14th, while Rasmussen claims he was in Mexico for training. DeRooy will not withdraw the entire team, but will allow the riders to choose to start the stage tomorrow. Adds that Rasmussen is also fired from the team. However the team has learnt that Rasmussen lied to them over where and what he was up to during the month of June when he was in fact in Italy and not in Mexico as he had told them. VeloNews is reporting that yellow jersey Michael Rasmussen asked an American mountain bike racer to carry blood substitute to Italy for him in 2002. The racer, Whitney Richards, says Rasmussen asked him to bring a pair of cycling shoes he had left in the United States to Italy when he moved there to live with his girlfriend in March 2002. Richards said he called a friend, Taro Smith, who holds a Ph.D. in physiology, and Smith recognized the contents as Hemopure, a hemoglobin-based oxygen carrier derived from cow's blood. Richards and Smith said they poured the contents down the sink, rather than risking Richards being detained at customs. Richards talked to VeloNews later in 2002, but only off the record, and asking that Rasmussen not be identified. He later was a source for David Walsh's current book, From Lance to Landis but again asked that neither he nor Rasmussen be identified. Why did he come forward now? Current Tour de France race leader Michael Rasmussen has been dropped from Denmark's national team, which will keep him from competing at the World Championships in Stuttgart. It will likely also stop him from competing in the Danish national mountain bike championships in August, and keeping him out of the 2008 Beijing Olympic Games, where Rasmussen had discussed racing a mountain bike. “Some questions seem legitimate to me. Why now since the warning dates back to June 29? Why did Mr Worre wait until July 19 with Rasmussen in the yellow jersey to give elements he had at his disposal since June 28,” he said. Prudhomme also mentioned that Rasmussen was cleared to race at the Danish national championships June 30th, and was tested both there, and several times during the Tour. “I cannot take part in a race arranged by an organization which looks to thwart me in this way,” he said. 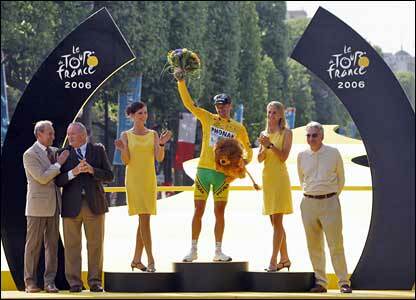 Lance Armstrong let it all hang out today, storming to a victory in the 2005 Tour's long time trial in St. Etienne. T-Mobile's Jan Ullrich came to play, but couldn't quite hang with Armstrong, finishing 2nd on the day, 23 seconds slower than Armstrong. The top 10 is a good demonstrator of US power in the sport: Besides Armstrong atop the heap, CSC's Bobby Julich was 4th at 1:33, Phonak's Floyd Landis was 6th at 2:02, Discovery's George Hincapie was 8th at 2:25. A little farther down the standings was Levi Leipheimer, 14th at 3:13, which catapults Leipheimer into 5th overall. Leipheimer will have to watch his back tomorrow, because Vinokourov is only 2 seconds behind him, easily overcome with an intermediate bonus sprint. CSC's Ivan Basso was 4th on the day after going out too hard and leading the race at the 1st time check. Michael Rasmussen, the king of the mountains, was the joker against the clock, switching bikes 4 times, and crashing twice, while losing 7:47 against Armstrong, and 7:24 to Ullrich, who moved into 3rd overall. Armstrong rolled through the finish and straight over to his children, who arrived yesterday to watch Daddy work. Ullrich: "Won't be easy overtaking Rasmussen"
Jan Ullrich says he's through chasing a win in this year's Tour de France, and that he'll instead focus on Michael Rasmussen, the Danish Rabobank rider currently holding 3rd place in the overall classification, 3:09 behind Lance Armstrong, and 2:49 ahead of Ullrich. "There are six stages left in the race and I'll be watching out for any opportunities where I can steal a few seconds here and there," Ullrich said here Monday on the race's second rest day. "My aim now has to be the podium. I can't expect to do any better, but even then it won't be easy overtaking Michael Rasmussen. He's been the revelation of the Tour so far." "I've had enough crashes to make a Hollywood movie," he quipped. Georg Totschnig is first to the day's last climb. Vinokourov, who's struggled to get back to Armstrong's group, just rode straight through and attacked. Somehow, once again, you've got T-Mobile chasing Vinokourov down. 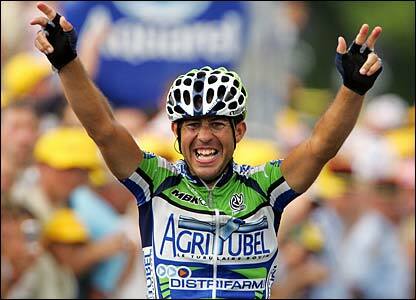 Klöden and Ullrich have brought him back. Cadel Evans can't hold the new pace, and he's off the back. Vinokourov, Zubeldia, Mancebo, are in trouble at the back. Klöden, Ullrich, Armstrong, Landis, Leipheimer, Basso, Mancebo, and Rasmussen together. One of the Euskaltels has come back with the pace returning to normal after Vino's attack. Zubeldia off the back. Basso launches an exploratory attack, and Landis and Leipheimer are slightly gapped, but Rasmussen, Mancebo, and Klöden are off the back. They've caught another back marker, Walter Beneteau. Bye, bye, Beneteau. Now Leipheimer is off the back. Landis is gapped. Unless they do something special, Basso, Ullrich and Armstrong are going to make up time at the summit. They're down under 3 minutes behind Totschnig. Armstrong takes the pace up a little, but he's matched. Garzelli, the last survivor of an early break, is caught, and the gap to Totschnig is 2:30. Whatever's going to happen, it's going to be Armstrong, Basso, and Ullrich: Totschnig may take the stage, but he's 14+ minutes down on the GC. The gap is now 2:01. Gap is 1:39. Armstrong, Ullrich and Basso all taking their turns. Armstrong can play defense here: He's got big gaps on both these guys. Seems like Basso or Ullrich has to attack. Sorry, Byron: There goes Ullrich, off the back. Armstrong is doing all the work. Basso is on his wheel. Totschnig gets the win in a 190-kilometer breakaway! It's down to Armstrong and Basso for 2nd and 3rd. They're picking up the pace, and Armstrong is getting a time gap, and he sprints in for 2nd. Basso third, Ullrich is coming in at 1:20 to Totschnig.